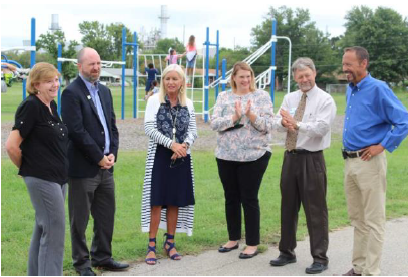 Students and staff at Liberty Elementary School are enjoying their new walking track funded by a grant from the Tobacco Settlement Endowment Trust (TSET). Schools and communities that have achieved “Certified Healthy Oklahoma” status and met grant criteria are eligible to apply for the TSET incentive grants. This program has an application process each year based on best practices, programs, policies and communications for Healthy Schools/Healthy Businesses through the State Department of Health and the TSET organization. “Once we qualified as ‘Excellent’ in the Healthy Business category, it afforded us the opportunity to apply for federal grants through TSET,” Smith said. Evans & Associates Enterprises have been installing walking tracks at most of the schools throughout the years and only charging for their costs. This makes constructing a track using PTA or district money easier to handle. The Liberty walking track cost $24,288.00. This means Liberty had to chip in the additional $4,288 to cover the rest of the track construction costs. Local patrons, such as Jenny Creech with OSU Prevention Programs, worked as their TSET Healthy Living Program Coordinator. Behind the scenes, she contributed to the schools’ successes and gives them tremendous support, Smith said. The Certified Healthy Oklahoma Program is a free, voluntary statewide certification that showcases business, campuses, communities, congregations, early childhood programs, restaurants, and schools that are committed to supporting healthy choices through environmental and policy change. Each Certified Healthy Oklahoma program has three levels of certification: Basic, Merit, and Excellence. These entities are working to improve the health of Oklahomans by implementing elements, policies, and programs that will help Oklahomans to eat better, move more and be tobacco free. Pictured from left are Sharon Howard, RN, BSN, MED., Program Manager, Healthy Schools Incentive Grants; John Woods, Executive Director of TSET Oklahoma; Shelley Arrott, PCPS Superintendent; Jennifer Martinez, Liberty Principal; Bret Smith, PCPS Executive Director of Operations; and Ken Luttrell (State Representative-elect for District 37.